CLASSIC Take a Walking Tour of Ho Chi Minh City’s historic landmarks including a stop at the Rex Hotel for a refreshing drink at the rooftop bar where the U.S. Military held the infamous “Five O’Clock Follies” during the war. Then visit the War Remnants Museum and bustling Ben Thanh Market. DISCOVERY For lunch, participate in a hands-on Vietnamese Cooking Class. Learn to prepare local dishes and how to recreate them at home. Last, but not least, sample your delicious creations! DISCOVERY In Chau Doc, take a Guided Walk through the local market and absorb the atmosphere as locals are busy buying and selling fish, meat, and produce. 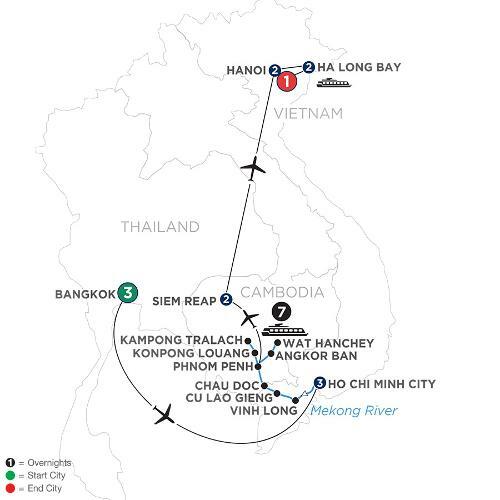 Then embark on an excursion down the backwaters of the Mekong. Along the way, see traditional floating homes, speedboat merchants, religious sites, a market selling dried goods, and more. DISCOVERY After lunch, take a Sampan Ride to the village of Long Khanh A for a Cotton-Weaving Demonstration of this well-preserved tradition. DISCOVERY Start your Guided Sightseeing at the silversmith village in Konpong Louang. Here, see talented craftsmen use age-old techniques to turn pure silver into works of art. In Kampong Tralach, board an ox cart for a ride through the beautiful Cambodian countryside. Along the way, stop to meet a local farmer and learn about his daily life. CLASSIC Continue your Sightseeing Tour of the Angkor temples at Ta Prohm. Tree roots cover the ruin lls, allowing you to experience the temple with the same wonder as early explorers. Then visit Banteay Srei, a unique temple built on a small scale from red sandstone, which can be carved like wood. En route, stop at a village famous for making Khmer noodles by hand. CLASSIC After lunch, enjoy an Electric-Cart Ride through the fascinating Old Quarter—with its 36 ancient streets where merchants trade as they have for centuries. Participation in this vacation requires requires purchase of the following flights from Avalon Waterways, not included in pricing: (1) roundtrip air from your U.S. gateway and intra-vacation air segments; or (2) intra-vacation air segments only, starting at $630. Required intra-vacation air segments are Bangkok/Ho Chi Minh City; Phnom Penh/Siem Reap; Siem Reap/Hanoi. Air prices were effective on February 6, 2019, and their availability is limited. At the time you purchase your tour, air prices may be higher.